SOLD Lissabon mitt dero gegend auff 10 stundt. 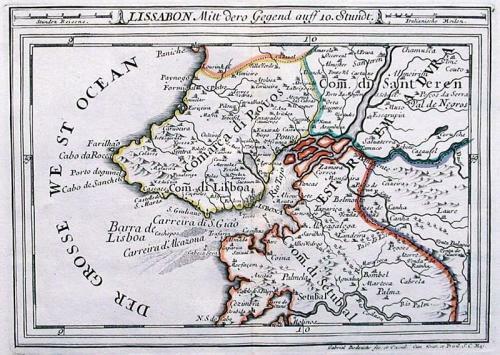 A 300 year old tourist map and guide to the countryside 30 miles around Lisbon. The engraving shows rivers, mountains, woods and numerous towns and villages in the surrounding area.There are two scales inserted in the map one of which is 'stunden reisen'. The stunde is a unit of distance defined to be 4800 meters (2.983 miles), approximately the distance a person can walk in an hour. The definition is consistent with the custom everywhere of informally adopting time units as distance units, as when we say "I live 10 minutes from school." Scarce. Fold(s) as given.